← Things Go Better with . . . Koch? The hardrooting staff has long been a fan of Rafael Nadal, the Half-Volley Hamlet of the men’s professional tennis tour. 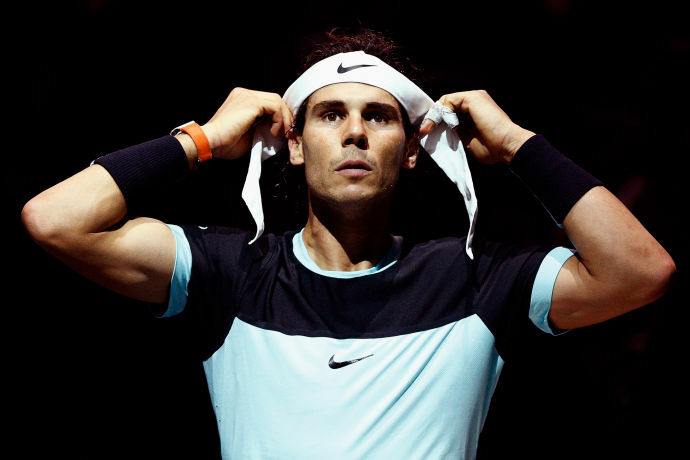 Rafa has been one of the most likable, ferocious, and – openly, sometimes painfully – introspective tennis players the game has ever seen. So it is with a great sense of sadness that we witness The Twilight of Nadal, as Gerald Mazorati just detailed in The New Yorker. It’s not easy—it’s wistful-making, like the first shortening days of high summer—to watch a great tennis champion begin to fade. Basketball stars and football heroes have teammates to magnify what they still have left, to mask their diminishments and even carry them, with luck, to one last big victory. Tennis players are always alone. When age and wear catch up to them, when they lose a step or a few miles per hour on their serves and forehands, and then the confidence that their speed and strength had engendered, they are isolated for scrutiny. They, of course, understand what’s going on, and try to feign or adjust, though body language and facial expressions have a way of revealing the true state of things: not the decline itself but the disappointment and, sometimes, an angry disbelief that what once was is somehow no more. Their opponents sense it, and pounce. We fans see all this, and find ourselves fidgeting before our TVs—it’s so subtly excruciating—and taking longer strolls during the commercials that come with those crossovers after every other game. Rafael Nadal is fading . . . The list could go on, and it does. And after every loss to a has-been or never-will-be, Nadal runs the same script: praise the opponent, ruminate about focus and confidence, talk about redoubling his efforts and working harder to get back to where he was and almost certainly never will be again. It’s gotten so that being beaten less badly by the top players is something of a victory for Nadal. 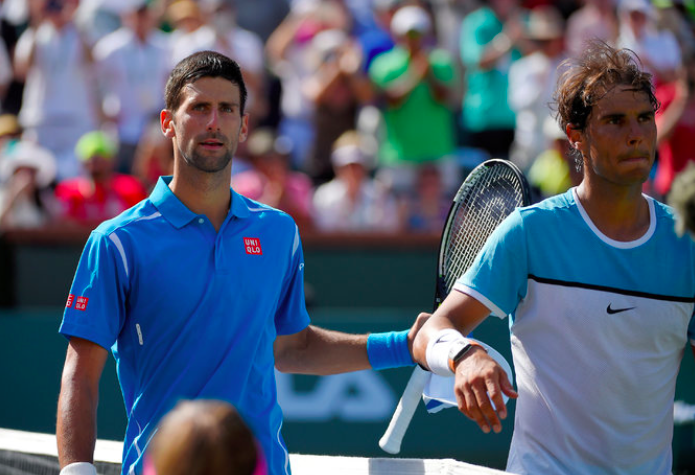 Exhibit A: Nadal’s straight-set loss to Novak (I Own Rafa) Djokovic at Indian Wells yesterday. INDIAN WELLS, Calif. — Even for the sport’s best, any success against top-ranked Novak Djokovic — however relative — must be appreciated. In the 48th installment of one of the longest rivalries in men’s tennis, Djokovic dispatched Rafael Nadal, 7-6 (5), 6-2, on Saturday in the semifinals of the BNP Paribas Open. Djokovic withstood an inspired start from the fifth-ranked Nadal before ultimately pulling away for his 25th victory over Nadal. He will face 14th-ranked Milos Raonic in the final on Sunday. Though Nadal, a 14-time Grand Slam champion, has now lost six straight matches and 13 straight sets to Djokovic, this match still represented progress . . . Right. After all, Djokovic beat him 6-1, 6-2 in the final of the Qatar Open earlier this year. That came after Nadal’s first-round exit in the Australian Open. So, yeah – making progress, eh? But that’s hardly the yardstick Rafael Nadal has wanted to be judged by for a long, long time. This entry was posted in Uncategorized and tagged Gerald Mazorati, Half-Volley Hamlet, Indian Wells, New York Times, Novak Djokovic, Rafa, Rafael Nadal, The New Yorker, The Twilight of Nadal. Bookmark the permalink. I’m almost afraid to ask: by any chance, does your license plate read “10SNE1”? Not yet, Bill . . . but thanks!